A couple of years ago, I would have written about the importance of the Keyword report in Google Analytics which showed us the search query that was typed into Google before the user clicked on our listing. We could get a good insight into what search terms were driving traffic to our site and which pages were showing up for these search terms. Sadly, this report is no more (well just about) as Google now hides the majority of this data and simply shows us '(not provided)' as the keyword. I'm not even sure why this report is still a part of Google's reporting given that it doesn't really report on anything! Anyway, we still have lots of reports to look at as marketers and one which you will no doubt be checking regularly is the Unique Visitors report. Probably the most looked at report in Analytics, as it gives a good overview as to how many people are visiting the website over a given period of time. For marketers, it's a little basic and doesn't really give us an idea as to what campaigns are working and what isn't. It does however alert us as to whether something is wrong (if we see a sudden drop in visitors) or if something has gone really well. It's also a nice report to send to other members of the team and management as it's something everyone can relate to. The new Channels report under Acquisition gives a good overview of the traffic being driven from Organic Search, Direct, Social, Referral and Other (this is where we see our visits from our Email campaigns, but it may vary depending on what you're tracking). For each channel we can see Visits, % New Visits, New Visits (as a number), Bounce Rate, Pages per Visit, Average Visit Duration and any Goal Conversions you have set up. This report is another one that can give an easy to digest overview of how each marketing channel is working for your website. The Queries report shows us the search queries that are being typed into Google and bringing up our website in the results. Alongside the number of Impressions, we see the number of Clicks, Average Position (in the search results) and the Click Through Rate (CTR). These stats are not 100% accurate by any means, but they do give you an indication as to whether you're showing up for relevant search queries and whether you're missing out on traffic because you don't appear to show up for your key search terms. The Landing Pages report shows you similar data, but broken down into landing pages. So you can identify which pages get the best CTR and which don't. This could highlight issues with how your listing appears in Google - for example, the Page Title, Meta Description and any rich snippets you have on your site. The Cost Analysis report (currently in Beta as of Feb 2014), looks like a powerful report for analysing performance across multiple paid search platforms (not just AdWords). You'll need to import cost data into your Google Analytics account for your other campaigns, then Google can show your campaign performance compared to other paid search channels. 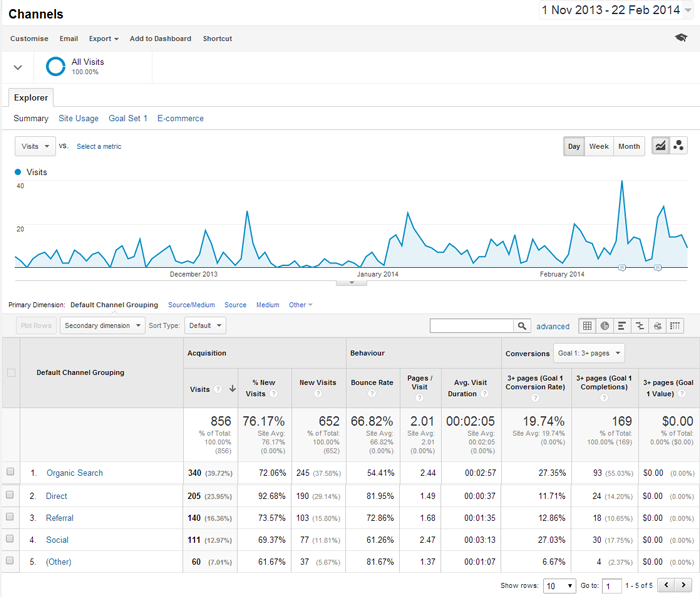 Are you a marketing professional or a business owner using Google Analytics? If so, which are your top 3 reports? Let us know in the comments below.